This past weekend, First Lady Laura Bush denied her possible successor’s request to have her wrist’s cast signed. It was earlier this summer that Cindy McCain broke her wrist in the Bronze Medal Round of the Beijing Olympics in the Shot Put competition. 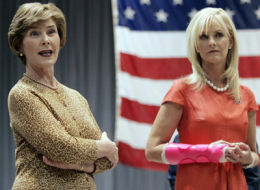 Cindy McCain (right), with her unsigned cast, standing next to an agitated First Lady.